South Superstar Rajinikanth's daughter Soundarya Rajinikanth will tie the knot with Vishagan Vanangamudi today, February 11 at The Leela Palace in Chennai. Various photographs are surfacing on the social media where the guests can be seen arriving at the arriving. The soon-to-be bride also looks beautiful in Abu Jani and Sandeep Khosla's attire. South Superstar Rajinikanth’s daughter Soundarya Rajinikanth is all set to exchange her wedding vows with Vishagan Vanangamudi today, February 11 at The Leela Palace in Chennai. The guests have already started arriving at the venue and various photographs are doing the rounds on the social media. The soon-to-be bride is also dressed up for her big ceremony. 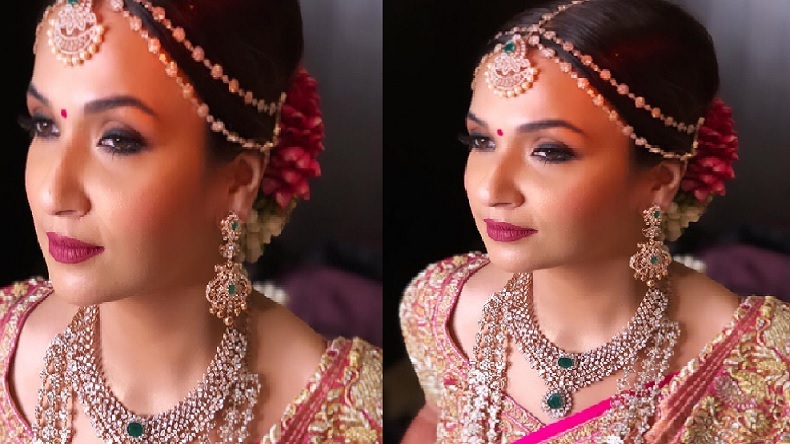 A photograph has been shared on the social media where Soundarya Rajinikanth looks beautiful in her bridal look. She opted for Abu Jani and Sandeep Khosla pink and golden silk saree. Her traditional braid, she looks stunning in Gerard Cosmetics’s liner and custom raspberry lips perfectly matched her overall appearance. She accessorised her look with the diamond necklace. She looks every inch of the South Indian bride. While Vishagan wore an off-white shirt and dhoti with a blue angavastra. He greeted everyone while heading towards mandap. The pre-wedding reception photographs also surfaced on the social media where the couple can be seen happily posing along with the family members. Soundarya and Rajinikanth’s pre-wedding ceremonies began on January 8 at Raghavendra Kalyana Mandapam in Chennai. Renowned Kollywood celebrities along with several ministers are expected to attend the wedding.